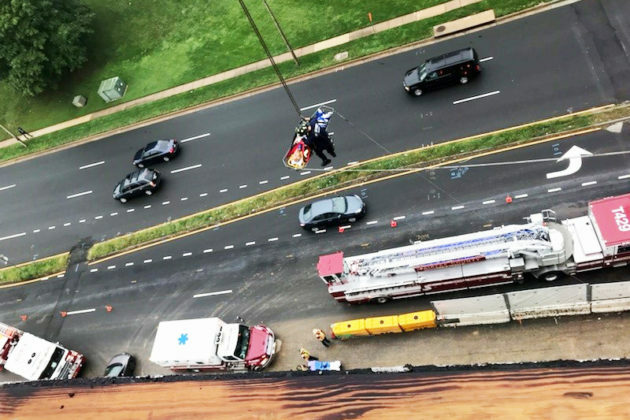 When a adult male on the sixth floor of a construction site had a medical emergency, Fairfax County firefighters had to improvise a rescue plan: the construction site crane. The rescue occurred on Monday (Sept. 10) at 4:20 p.m. on the 8300 block of Westpark Drive. While the medic crew assessed the patient, I worked with the construction site supervisor to determine the best way to remove the patient. It was quickly determined that there was no working elevator and the stairwell was too narrow and full of construction debris to remove the patient via that route… Once Medic 429’s crew determined that the patient had to be removed lying down, due to his condition, our team worked with the site supervisor to utilize the sky crane to move the stokes to the roof for patient removal. 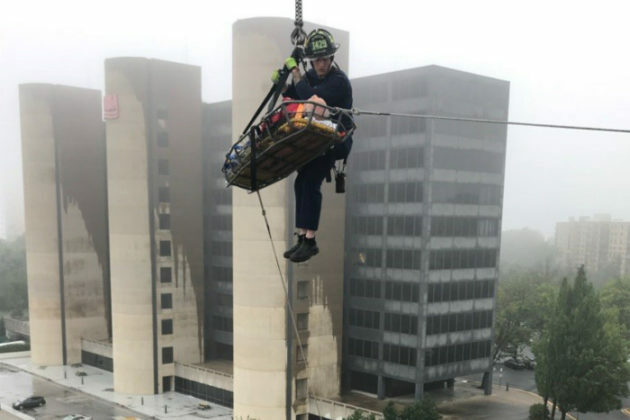 Once the patient was attached to the crane, a paramedic rode down with the patient to continue administering aid until the patient could be secured for transport to a local hospital.